Roasting is one of our favorite ways to prepare vegetables in The Happy Kitchen. The texture is crisp on the outside with a tender interior. The possible combinations of vegetables, oils, herbs, and spices are endless. And we find that roasting brings out a lot of the usually-subtle flavors in different vegetables, like the sweetness in beets or onions. 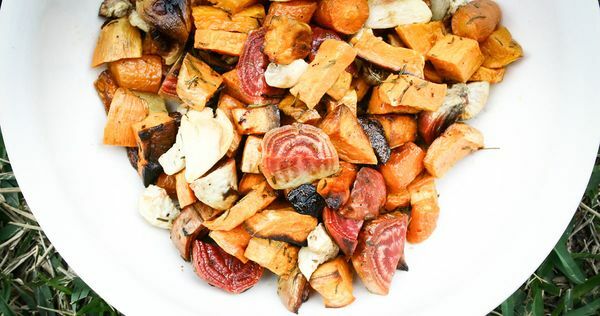 Roasted vegetables are also pretty easy. They just need to be stirred once or twice during cooking, meaning that you can stick a pan of veggies in the oven and get on with the rest of your dinner prep. For the next edition of our cookbook, we wanted to include a roasted vegetable recipe that showcases just how versatile and simple roasting can be, and we’re sharing it with you below, as well as a guide of cooking times for lots of different vegetables. This can serve as a starting point to find what tastes best to you. Our favorite combination is 3 medium carrots, 1 large parsnip, 1 bulb fennel, and 1 red onion, all diced and tossed with 1 teaspoon each of fresh rosemary, thyme, and sage and roasted for about 40 minutes. Additional herbs, spices, sweeteners, etc. In a large casserole dish or on a baking sheet, mix together the vegetables, herbs, oil, and any additional ingredients. Spread out evenly in the dish or on the pan. Bake for 10-60 minutes (or until all vegetables are tender), stirring once or twice during cooking. See chart for estimated cooking times. If roasting vegetables with different cooking times, roast them separately or add the quicker-cooking vegetables later into the cooking process. If adding sweeteners, glaze, or citrus, do so after cooking.